Staff consultants will be presenting to the Joint Facilities Advisory Commission (JFAC) its findings on the Phase 3 Use Determination Process for the former Buck Property on Wednesday, Feb. 27 at 7pm. The meeting will be held in the Cherry/Dogwood conference room on the lobby level of the Bozman Government Center (2100 Clarendon Blvd.). The County completed the acquisition of the North Quincy Street Development (formerly known as the Buck Property) on Nov. 20, 2017. Located across the street from Washington-Lee High School, the 6.1 acre site, zoned for light industrial and commercial uses, contains two warehouses and two buildings used as offices. The County approved an option agreement with owner Bill Buck and his family’s three limited liability corporations in May 2015, to pay $30 million for the property in installments. November 2016: Formation of County and School Board-appointed Joint Facilities Advisory Commission. This was a recommendation within the 2015 Community Facilities Study. Learn more about the public process. June 27, 2017: Use considerations for Buck Option C (northern part of property) was presented to County Board. Nov. 20, 2017: County acquires the Buck Property. March 2018: Initiation of Phase 3 Use Determination Process, analyzing use considerations developed by JFAC. Anticipated to take 9-12 months. February 27, 2019: Staff consultants to present Phase 3 Findings of the Use Determination Process. Read June 25, 2018 letter from County Manager Mark Schwartz to APS Superintendent Dr. Pat Murphy on APS’s request of interim and long-term use considerations for the North Quincy Street Property. Evaluate the feasibility of repurposing the North Quincy Street site to house the Fire Reserve Vehicles and Logistics, the Police Impound Lot and Forensics function, and the Department of Public Safety and Emergency Management. Arlington Public Schools will assess the feasibility of using the building adjacent to Hayes Park for swing space. Traffic, neighborhood and environmental impacts, including exploring mitigation efforts and screening options. 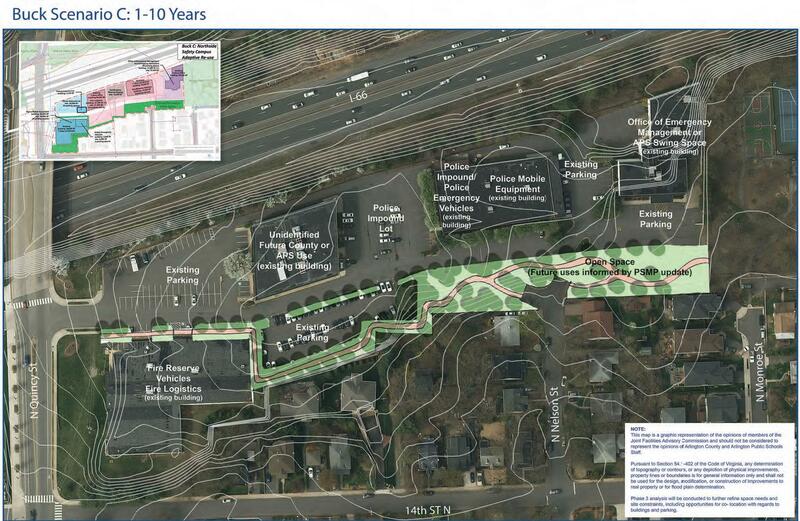 A timeline and the amount of funding needed to repurpose the site for the relocation of these facilities. Facing increasing challenges over operational space, the County will expedite the planning and relocation of the Police and Fire Reserve Vehicles to the N Quincy Street Property. Funding is requested in the FY 2019-2028 Capital Improvement Plan, however, relocation will not occur prior to spring 2020. Spare and reserve equipment and furniture inventory that was originally housed at the APS warehouse. The relocation will allow Schools to repurpose their warehouse to provide additional space for their operations. Traffic signal equipment and bus shelter parts. Potential site for snow haulage and melting operations during major snow events of greater than 8-12 inches.